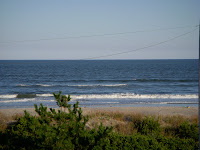 Greetings from Sea Isle City, Stone Harbor and Ocean City, New Jersey: The weather is fantastic, the company full of life and fun and all the food is great. 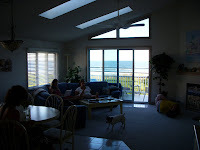 We are staying the week in Sea Isle City, on the Edge of Strathmere, mere steps away from the beach and feet away from the bay. In a word - GLORIOUS! Came down on Saturday afternoon and so far have ridden to several other towns to explore the sights and tastes of the best of the shore. It's easy riding here, long flat roads with a few inlet bridges to cross. 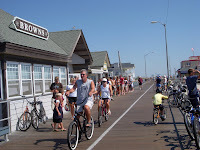 Each town, with the exception of Ocean City, which is as big as 3 or 4 shore towns combined, are quick rides to manage. I biked down to Stone Harbor on Sunday, in search of sights and Springer's Ice Cream. Best Homemade ice cream at the South Jersey Shore. The 23 mile round trip added some miles, worked off the chocolate almond ice cream calories and gave me a great opportunity to take in sights of shore towns previously unexplored. Monday, I biked the opposite direction, north, into Ocean City and traveled along the 5 miles of the OC Boardwalk. I also somehow managed to run into my triathlon and biking Buddy Sue S, amidst the throngs of thousands on the boardwalk. 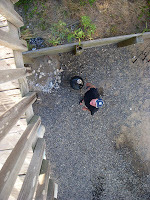 Visited with family friends, the Hoelters, and took a ride over the Long Port Bridge. In between biking, eating pancakes at Uncle Bills, hanging out on the decks, we've been running across the street to dive into the ocean. Next up, the 30 mile bike ride down to Cape May, a trip to Atlantic City, strolls on the Boardwalks of Sea Isle and Ocean City, and of course, another ride down to Springer's for one last taste of the summer. Ice Cream Treats at Springers. 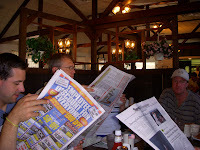 Breakfast and the Paper at Uncle Bill's in Strathmere, NJ. 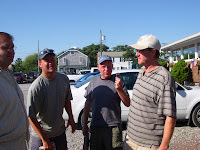 Fun and Flags with The "Beach Boys" at the Shore. A View of Rob from the Upper back Deck. He's the Grill Meister cooking up some ribs for dinner. 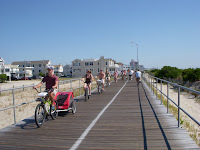 Miles of Biking along the Ocean City Boardwalk. There were hundred's of people on bikes, surrey's and tandems for the last hurrah of Labor Day 2008. View from our Deck at the Beach house. It's lovely! Hanging out with the Gang and Hamlet, in our "living room" for the week.